Eight in the morning, low fog, five degrees, and a group of forty people wandering through Auschwitz concentration camp. It was eerie and weird - we couldn't see the end of paths, everything was bathed in grey, and the paths were dug out of the snow. We had a Polish tour guide who spoke only the english that she'd learned in order to conduct these tours (I think), who showed us first through Auschwitz I, including: barracks, official headquarters, punishment cells, the "death wall", photos of prisoners, the well known rooms full of hair and shows and personal belongings, the gallows, the house in which the first commandant lived with his family, the gas chambers, and the crematorium. 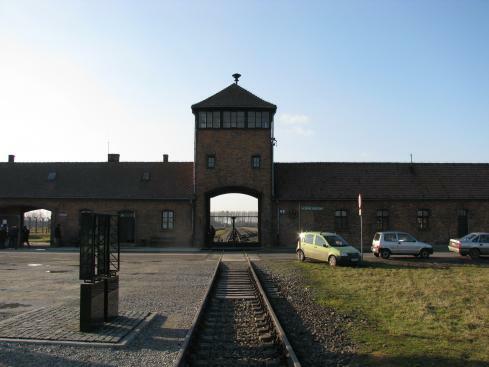 Then we went across to Auschwitz II Birkenau, where we spend a wee bit of time just looking at one barrack and the sanitary barrack where prisoners used the bathroom and showered. I don't really know the words to describe it all... It was intense and emotional, but I found it really hard to look it in terms of 'this really did happen'. To me, it seemed like more of a movie set where we've seen awful things happen but they were all acted out. I know that's not the case, but I think it all goes back to when Dad used to tell me (after I watched scary movies) that I had to remember that even though the scene looks horrifying and scary and gory and gross, I have to remember that in actual fact it's an actor with costume and makeup surrounded y camera crews and other people. I didn't react at all in the way I expected. It was kind of numbing, in the sense that there were no tears or even feelings of anger or sadness, more just horror that the stuff that the guide was telling us were true. I found one room awful from the off - the room full of the suitcases of the prisoners that had names and addresses of the previous owners. The cases had names, addresses, and even dates of birth on them so we even knew their ages when they arrived. It sounds stupid, but even that room was okay until I saw one case that was names Ella. It was like, "wow this really did happen to people just like me, being punished and torutured and killed for just being who they were..."
Anyway, we're in Prague now and Lex and I are headed down to the hostel bar to drink absinthe.